The preferred wave count continues to track extremely well and, as they say, "worked like a charm" again yesterday. In this update I'll discuss the levels I'm watching for the short-term, and I'll also provide a bit more detail on my preferred intermediate outlook. I remain bullish on the long-term, not because I feel the fundamentals support it, but because the central banks are still flooding the world with liquidity. And as long as that continues, it will drive up asset prices. The Fed seems to be trying with all its might to blow the biggest bubble it possibly can. Somewhere down the road, I suspect this will all end badly (just as the last two bubbles have) and Bernanke will end up with a huge, unruly wad of US Mint-flavored bubble gum tangled up in his beard. Then it will be time to break out the scissors. In the meantime, though, the bubble is what it is -- and there seems to be no reason to try and fight it at the moment. Let's start with the short-term charts and build from there. The pattern I've been anticipating and tracking is called an ending diagonal, and so far it's done the "diagonal" part of the pattern perfectly. Whether it will do the "ending" portion equally as well is likely to be revealed in the next session or two. It is worth noting that yesterday's action did fulfill the minimum expectations for this pattern, complete with an overthrow of the upper trend line -- so while one more new high would look better, it is not required. 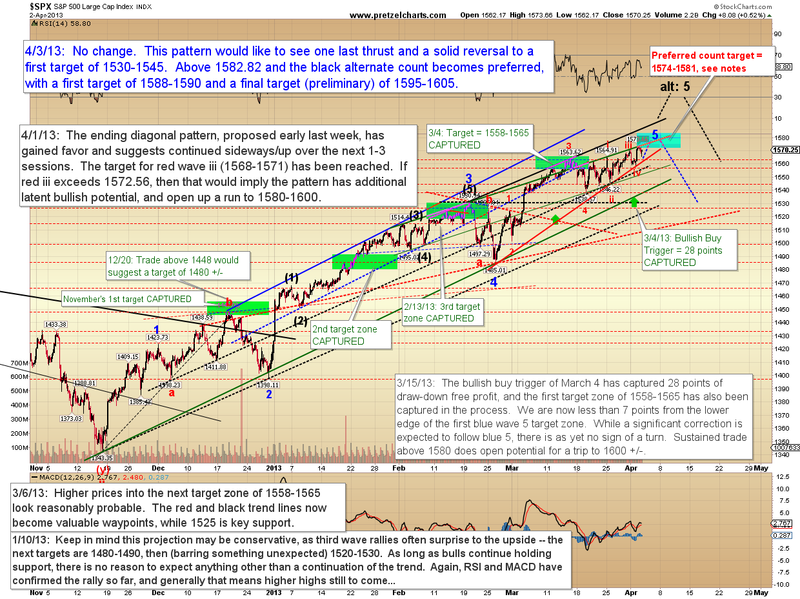 The key upside level to call this pattern into question remains 1582.82. I have mentioned this next caveat in the past, but not recently: when patterns such as this appear, if they turn out not to be ending patterns, then they are usually compression patterns which launch the market higher. 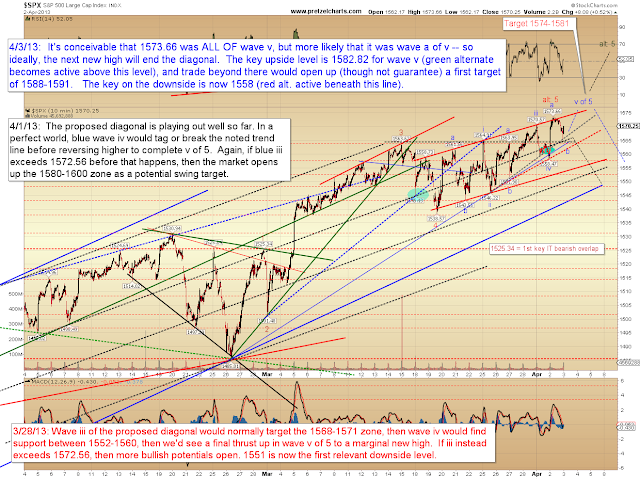 It's rare that they're anything in-between, so we should keep that in mind if the market sustains trade above 1583. That's the caveat out of the way -- but because of the position of this wave within the larger structure, it is more likely that this is indeed an ending pattern. To the downside, trade below 1558 would suggest wave v of 5 is complete -- or that the pattern was morphing into something entirely unexpected. 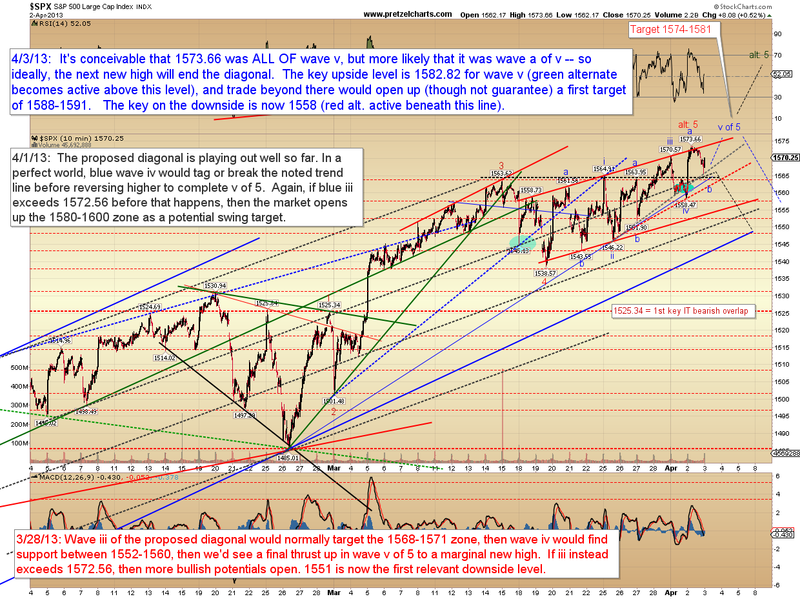 The hourly chart discusses the targets if 1582.82 is claimed. Ironically, the only thing bothering me about the pattern is that it's tracked so incredibly well. Whenever the market tracks this perfectly, I start suspecting that it's getting ready for a fake-out -- nevertheless, this pattern provides a clear trade setup that's hard to ignore. From an intermediate standpoint, the risk/reward is solid. 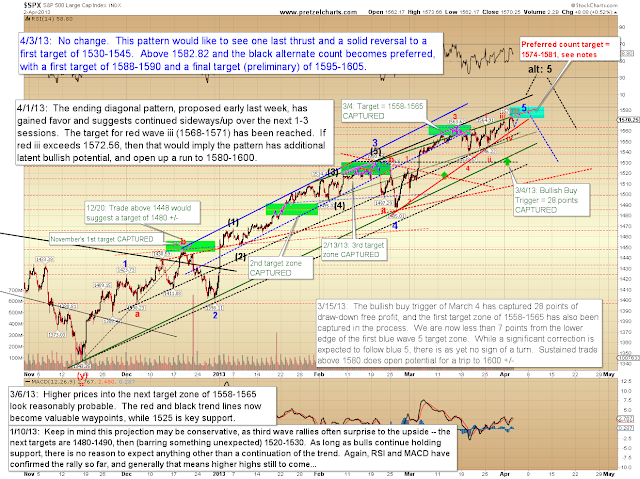 If the pattern completes cleanly, there's potential for a fair amount of downside. Don't forget to keep the more bullish alternate count in mind when looking at the chart below, as I have not detailed it here. In conclusion, the market has so far provided a clean pattern and given us clear levels to watch. 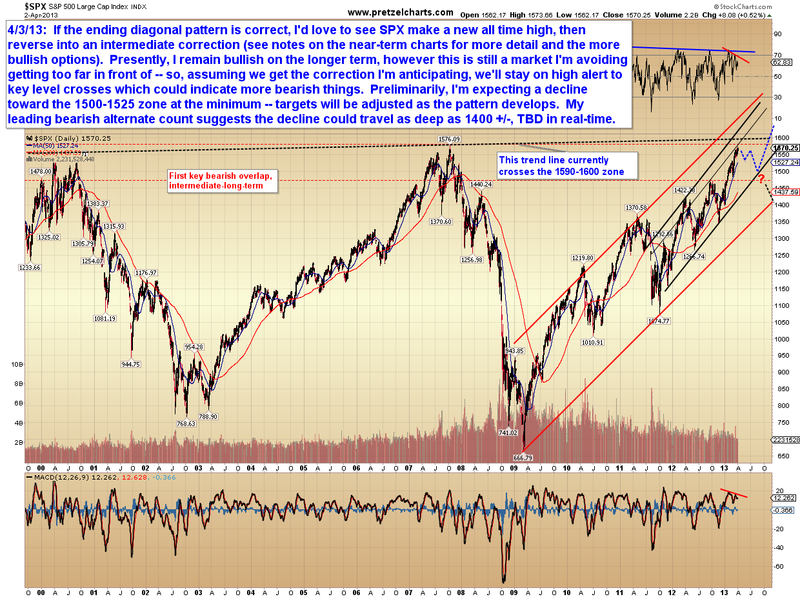 This is about as good as it gets -- all that's left now is for the market to perform or invalidate. Trade safe.